Draw The Attention of your Website Visitors, Explode Your Opt-In List, Maximize Your Affiliate Commissions, Increase Sales of Your Own Product(s), Gain a Competitive Advantage, Market and Promote Anything You Want Successfully! That's a pscychological/human nature fact and a marketing fact that not only you should know, but you should also take full advantage of in your online business to increase your profits. Win Prizes! Winner! You Win! So do your website visitors, prospects, customers and opt-in subscribers. How about you use this powerful 'exciting feeling' to your full advantage? Offline businesses already are, by using the effective, time-tested and proven power of scratch cards! Here's WHY People Love Scratch Cards! 1. Winning gifts and prizes is something that all people absolutely love! 2. Not time consuming at all. All one has to do is scratch for a few seconds and possibly win something valuable! 3. Involve that feeling of excitement and enthusiasm! 4. What one stands to lose by not scratching. People are afraid they might lose 'gold' if they don't scratch. 6. Easy to do - not involving any hard work. Jerry is teaching a baby mouse how to tie a bell around the neck of a cat; Tom. Jerry approaches Tom, who is faking being asleep. Tom catches Jerry as he's trying to tie the bell around his neck and beats him up. The baby mouse swallows its saliva in fear and goes up to Tom, who is frowning (having just finished beating up Jerry), and offers him a gift box! Tom smiles and gestures: "For ME?! :)"
Baby mouse nods, saying yes! Lesson: Gifts are the way to the heart of your customers and... Tom. How would you like to utilize the irresistible power of scratch cards to maximize your profits on the web? On the web?! How? Scratch cards are physical, printed cards. You mean to say there are also web-based scratch cards? I've got Good News for you! Now you can create your own professional-looking, stunning online scratch cards with text and images and branded with your logo for your website and shopping cart in minutes, using Scratch Card Generator. 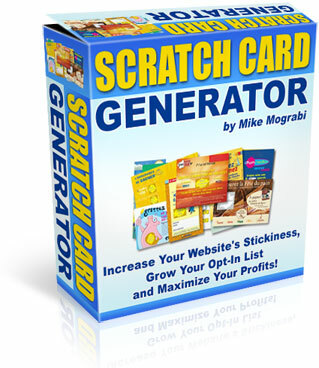 Create scratch cards that draw the attention of your website visitors, explode your opt-in list, maximize your affiliate commissions, increase sales of your own product(s), market and promote anything you want successfully! What Can You Use Scratch Card Generator For? People are being bombarded with tons of emails, ads, promotions, free reports, special offers, free gifts, and so on every single day, so it takes a little bit of creativity to differentiate yourself from others and stand out from the crowd. Increase your website stickiness. People will keep revisiting your website if they know you're always offering them a chance to win valuable prizes and gifts via scratch-n-win cards, or scratch, match-n-win cards. Explode your opt-in list. People will give you their names and email addresses just to participate and scratch that silver layer to see what "surprise" it's hiding. In this method, you get their names and email address before they play. Or You can set the chances of winning 1:1 and have people give you their names and email addresses to get the prizes and gifts. :) "Congratulations! You won! To claim your prizes enter your name and email address." This is a method where you get their names and email addresses after they play and "win"! Add perceived value to your free gifts and giveaways! Instead of saying: "Get your free report", You can say: "SCRATCH & WIN $179 report!" Make your opt-in list subscribers reconfirm their subscriptions to your newsletter/ezine! You can have them all "win" a copy of the report, and to download it "enter your first name and email address." Bring awareness to any product you want. Make your website visitors and opt-in list subscribers aware of any product you want. How? By having its image displayed on the scratch cards! Example: "Scratch and match 3 covers of 378 Internet Marketing Predictions, and win a special prize!" Tip: You can even offer one or more free copies of the product you want to attract your visitors/newsletter subscribers' attention to. This is even more powerful than the previous example. Example: "Here's your wonderful change to Scratch and Win a copy of the two-volume ebook, 378 Internet Marketing Predictions!" By the way, the scratch area itself can be any image you want! What a great implicit way to bring your site visitors' attention to any product you want to promote! Increase your affiliate commissions by running stealth, 'implicit' promotions of affiliate products. Instead of promoting affiliate products in a traditional, straight-forward way, you can "promote" them using scratch cards, in a way similar to the previous outlined methods. You could also increase your affiliate commissions by giving scratch cards to people who buy through your affiliate link s for a chance/opportunity to win gifts and prizes. Increase sales of your own products! Increase customer satisfaction! Customers are always looking for an extra value in their purchases; chance/opportunity to win gifts and prizes. Scratch Card Generator Features & Benefits! Create as many scratch card projects as you want. Generate as many scratch cards as you like. 1. Scratch-n-Win Cards: participants scratch for a chance to win whatever is hidden under the scratch area. 2. Scratch, Match-n-Win Cards: participants scratch for a chance to win whatever images match under the scratch areas. Rich, powerful and interactive Scratch Card designer. Design your scratch cards using built-in image or by uploading your own images. Create your cards by going through three tabs or steps. The tabs make it easy for you to go back and forth to edit anything. Create scratch cards of any dimensions. You have full flexibility and control over the card size. Customize your scratch card background. It can be an image or a colored background (one color or gradient). Brand the scratch cards with your logo. Add your logo in one of 6 different positions in the background. Add text to your scratch card and format it as you like (color, font, and size). Convert your favorite images to scratch areas! What a great implicit way to bring your site visitors' attention to any product you want to promote! Resize the scratch area without losing its quality. This is an important feature especially if the scratch area is an image. You can resize it manually to make sure it fully covers what it should hide (the prizes, etc.). (1) Text, (2) image or (3) blank/white area. 1. Text: Format it as you like; color, font, size, etc. You can also add a link to the text. The link would open in a new window. 2. Image: Add title above/below the image. You can add a link the title or image. The link would open in a new window. Drag and drop scratch areas and text elements wherever you want on the card. You can change their positions easily with your mouse. Choose how many cards you would like to generate and set the number of winning cards. The generation will be done on the fly. Cards are generated using a randomization technique to make sure no one knows what card is being generated for him. Set the time period between scratch processes. For example, you can set it as one scratch participation per day. No one can participate more than once a day. Display a message to winners/losers and redirect winners/losers to any URL you like! Set a specific number of cards for each participant. You specify the number of times people can participate and scratch for a chance to win. Create scratch cards for all your site visitors without requiring signing up, or request from people who wish to participate to subscribe/sign up. Participants can scratch online or download the cards as zip files to scratch them later. Scratch cards can be displayed on any browser, because they are Flash! Check how many cards have been scratched. Check winners and what they won. Participation that requires subscriptions enable you to know the emails of winners and to email them. Upload up to 20 images in bulk to each image category: background images, scratch images, 'win' images, 'lose' images. Generate a list of participants. Edit/delete participants. Worth $197 As A FREE Bonus! 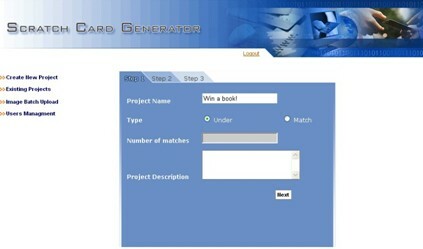 Scratch Card Generator is a brand new software system with major potential. Practically every online business in every niche will have a use for it. If you order Scratch Card Generator today, you'll also receive resell rights to the package including this sales page too - as a free bonus. That's a $197 value, and you can make several times your investment on Scratch Card Generator just by reselling the software and keeping 100% of the proceeds! Download Your Scratch Card Generator Now! 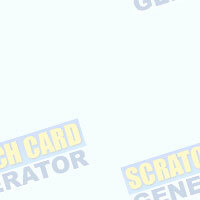 You can download Scratch Card Generator and start using it in minutes! You can grab your own copy of Scratch Card Generator right now for only $25! This is one-time payment, NO annual or monthly fees! 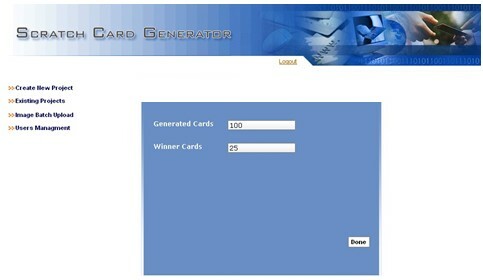 Own Scratch Card Generator Right NOW for $25! Because we're so confident you're going to love Scratch Card Generator, we're willing to offer an ironclad, 100% money back guarantee. Try it out and put it to the test! If you aren't completely satisfied, simply contact us anytime within 30 days and we'll refund all of your money. Order NOW -- and you'll be accessing the software in just a few minutes time!